In Sendai and it’s hard to believe the destruction. Today many thoughts and memories of the 2004 Asian tsunami came back to me as I traveled around Ishinomaki and talked with those affected by the tsunami. One couple I spoke wit h had received help from JIFH in the form of food and volunteer labor. I visited with them while they were hard at work cleaning out mud from their home. It was tough to watch them sort through their home and memories, many of which were caked in mud and the rest lost to the sea. When the earthquake struck and the tsunami warning signals went off they were at home, but quickly left their home on foot and ran for the hills away from the sea. In the following 20-25 minutes they made it to high ground but sadly lost friends and family who were unable to get away in time from the wall of water and debris. The wife was quite eager to share her experience, complete with details of watching the wall of water come her way. Soon the husband, who was a bit more reticent, chimed in with hand motions and more details. As the JIFH staff made clear, especially in these more northern and rural areas, elderly Japanese rarely open up about their thoughts or emotions and instead soldier on with great endurance. As the conversation ended the JIFH volunteer felt it appropriate to ask me to pray and so I felt it an honor to ask God’s presence, peace and help on this older couple trying to rebuild a life among the rubble. Later in the day, with several JIFH staff, we were able to bring some food to a shelter where we visited with one of the women who lives in a relatively small area with 18 other families. She told of feeling the earthquake and then hearing the tsunami warnings go off. Thankfully, she said that everyone in her village was able to escape prior to the tsunami coming in. But the destruction from the wave left their village in rubble. It was several weeks before she was able to return and see firsthand what she and her family lost. She is thankful but now must contend with crowded and hot conditions with the 18 other families. She has put her name in a lottery for temporary shelter but does not know how long it will take. In the meantime they make do with one fan and one refrigerator for all the people in the shelter. There was no hint of complaint, but rather a resolve to endure and rebuild. An update from Director of Emergency Response Peter Howard, who was in Japan last week and met with our partner organization Friends with the Voiceless International (FVI). Pastor Yoshio explaining how their church is reaching out in their community. Today while traveling with Friends with the Voiceless I met Yoshia and Toyomi Sanga of Grace Garden Chapel. It was truly encouraging to meet two leaders who are pouring themselves out on behalf of those displaced by the nuclear fallout from the Fukushima nuclear plant. 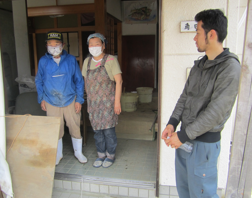 With a heart of compassion matched by action, Yoshio shared how they have been called to minister among the displaced people living at the Fukushima Convention Center shelter. Many of these people are from Tomioka, a town that is currently empty because it is located two kilometers from the damaged nuclear plant. 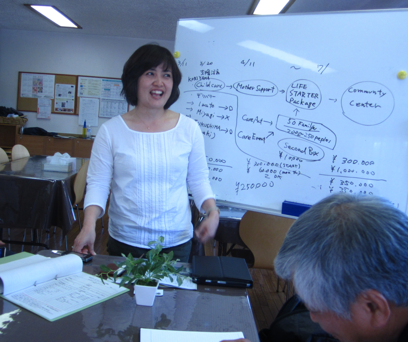 I was able to visit with the people of Grace Garden Chapel in Fukushima prefecture and hear how their pastor asked each church member to research the earthquake and nuclear fallout needs of their communities. Yoshia Sanga (the senior pastor’s wife and a pastor and mobilizer herself) told me about the childcare, young mother care, and starter packages they are organizing as a church. It began when they visited the shelter, which was housing over 2,500 people, and they saw some children in a corner without anything to engage their attention. Yoshia soon mobilized volunteers from her church and elsewhere to begin organizing playtime, study and music for the children. This soon got the attention of the government, which provided a bigger space for the volunteers to create these child friendly spaces. More importantly it got the attention of the children and parents as the numbers grew, and so did the gratitude. One woman shared how her nine-year-old daughter could not sleep through the night, but after she began joining in the activities she was soon sleeping through the night. The calming effect on children brought greater peace not only to young mothers but also to grandparents and neighbors who are all doing the best they can, living close together in the shelters. Additionally, Yoshia started the Young Mothers Support center through which she tries to bless young mothers by helping to provide childcare for babies so mothers can get some time alone to run errands or to be with friends. As part of this, Yoshio was able to get a beautician friend to come and cut hair at the shelter and enlisted Starbucks to come and serve free coffee. Finally, through these relationships Yoshio and her church and team of volunteers have begun compiling and distributing “Life Starter Packages” to families in need, which allow those families who are moving into temporary housing to start a kitchen with supplies like bowls, plates, mixers, refrigerators, etc. In the course of such intense relational ministry, Yoshio and her team are regularly asked ‘why are you here?” It is especially unique because she and her husband are not from the area and when many or most people who could leave did so, they stayed. This presence is having a significant impact. Young mothers, grandparents and others continue to express gratitude for how their children are adjusting better and sleeping at night without nightmares because of the child centers. The elderly find relief through simple things like massages that relieve stress. Even the Mayor has taken notice and expressed deep gratitude for the ministry and hope-filled support of Yoshio and her team of volunteers through Grace Garden Chapel. I asked what the impact was on the church members and was not surprised to hear how it has bound them together as a ministry. People are joining together to serve while others are meeting regularly to pray and intercede for God’s mercy. But the hours, the stress and weight of such ministry does take its toll. Please pray for the leadership and parishioners of Grace Garden Chapel. Pray that God and others in the body of Christ minister to their needs even as they pour themselves out on behalf of others. They have a vision that the Christian church can truly meet physical and spiritual needs as it “stays behind” and ministers among those living with the real and imagined dangers of nuclear radiation. 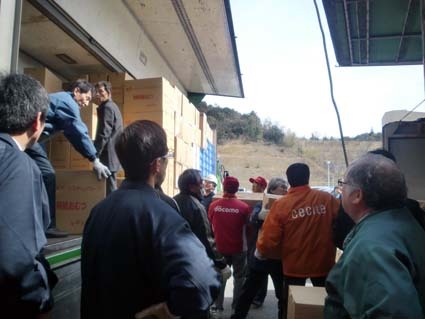 FH partner Friends with the Voiceless International (FVI) is currently responding to the needs of Fukushima residents affected by the earthquake and tsunami. 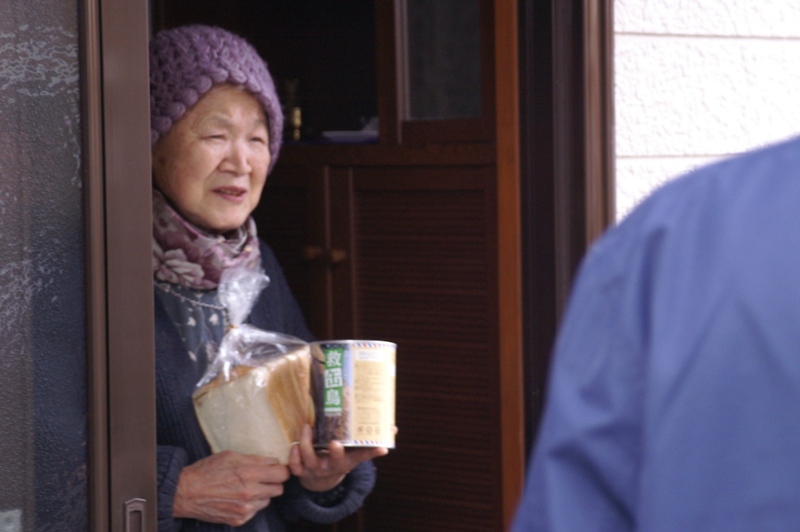 Despite the threat of radiation from the nearby nuclear reactor, local pastors and congregations have refused to abandon residents in the area and continue to reach out with food, supplies, and comfort. Miyuki Numata, FH Canada’s Director of International Programs, returned from Japan a few weeks ago where she connected with FVI in Fukushima. She noted how the local church is reaching out to people overlooked in larger relief efforts. Prior to the disaster churches did not have a very visible presence in the local community due to the small number of Christians, but now people recognize that churches are providing essential supplies and are often shocked that the help is free. Many recipients are unable or unwilling to evacuate because they are elderly, handicapped, or bedridden, or they have farms with animals they do not want to abandon. Tsunami recovery work is unique comparing to other natural disaster relief work like flood or earthquake because everything is washed away by powerful waves in a matter of minutes. When tsunami hit in South Asia in 2004, the cleanup and recovery work began rapidly in villages and coastal towns in Thailand but the spiritual and mental recovery was a slow and silent battle. Local fishing villages gradually picked themselves up again because fishermen knew what it meant to take risks as they had been living all their lives depending on water and boats, if they were able to overcome the fear of water again. …Our focus of action plan immediately became the recovery of local economy and how to protect local farmers and other small businesses as Fukushima’s economy is said to be frozen already and it will only go down due to the radiation and prolonged solutions about the nuclear plants. As we were talking with the pastor and his wife, it became obvious to all of us that expanding relief action (distribution of handouts) would only keep the local economy inactive and keep the evacuees passive. We realized that we should find ways to turn that trajectory as quickly as possible and start building actions toward building a long term future. USAID’s Office of Foreign Disaster Assistance helped arrange a flight through the US Marines on a C-17 Australian military plane to Sendai…it was encouraging to see the three militaries working together in this way on such urgent and life-saving measures. We arrived at the modern and massive Sendai airport – now full of mud, trees and debris. A ghost town except for the US and Japanese military and emergency workers. Walking the halls of a massive empty airport felt eerie and strange. Thankfully Miyuki is here – without her I would be lost. Through dropped cell calls and canceled rides she eventually helped arrange our way from the desolate coastal area inland and to the JIFH base which had electricity and heat….45 minutes away. It is snowing and a cold wind is blowing. We joined a group of responders (JIFH and others) along with local pastors doing their daily debriefing. One of the pastors told of working at the feeding center and how one person exclaimed to him “Arigato KiristuSan” – roughly translated “thank you Mr. Christ” or in essence thank you for being Christ to us! It is just one example of how Christ’s body is making an impact here in Japan. It certainly has been unifying as churches and ministries are working together. The school we are in is going to reopen (thankfully) but it means JIFH and about 50 responders all have to move. Tomorrow Miyuki and I will join Chairman Ryo Iwahashi to go to the field to help with distributions and meet some of the local pastors who are helping out in their respective communities. Distributions are going on now through distribution centers and via churches and volunteers. Items of distribution include toilet paper, kerosene, noodles, rice, bread, gloves, blankets and more. Unloading relief supplies in Sendai. JIFH Chairman Ryo told us today of their experiences in recent days. They distributed 2000 cans of bread via local church networks and through a distribution center. This was donated by a Christian businessman here in Japan and added to the supplies being distributed by JIFH. 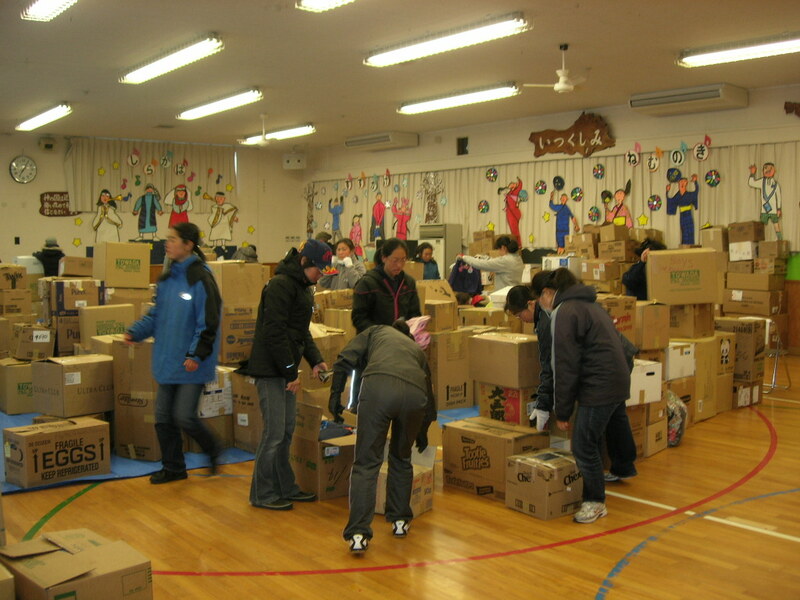 This took place in Sendai (Rokugo community) both at a junior high used as a shelter and distribution site, as well as through churches. One pastor described going door to door in their community meeting those affected and distributing bread, etc. One older woman was a grateful recipient whose heart is breaking as she has two daughters who are unaccounted for. I wonder how many times her story is repeated throughout this region? Lord have mercy on her and so many here in Japan. “At midnight on March 15, my wife and I headed for the north with a truckload of relief goods. The police graciously gave us special permission to buy gasoline after hearing our story. On the way, as we saw shops, we bought anything we could buy…The radio was warning us not to go close to nuclear plants as they had exploded again, but we decided go ahead anyway…we finally arrived at one of our churches…that we are using as an emergency shelter. Please pray for Dr. Kanda, Rev. Sato, and FH staff as they reach out to those affected by the disaster. I lift up my eyes to the hills– / where does my help come from? My help comes from the LORD, / the Maker of heaven and earth. indeed, he who watches over Israel / will neither slumber nor sleep. the sun will not harm you by day, / nor the moon by night. the LORD will watch over your coming and going / both now and forevermore. As I reflect on the church in Japan I am struck by the small number of Christians (less than two percent of the total population) but also by their incredible commitment and heart to respond to those around them. I am in regular contact with one such Christian – Dr. Kanda, President of Friends of the Voiceless, one of Food for the Hungry’s partner organizations. 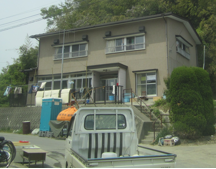 FH established contact with Dr. Kanda shortly after the earthquake and tsunami hit Japan and we are receiving regular reports about the Japanese churches’ activity on the ground. After talking with Dr. Kanda and hearing his passion for seeing the church respond to this disaster I got chills thinking about what God might do through this small band of believers during such a difficult time. I thought about Gideon when he prayed, “where are all the wonders our ancestors told us about?” (Judges 6:13). Of course the answer was that God did amazing wonders through a small band of faith-filled men under Gideon’s leadership. May we see similar miracles and wonders under the leadership of a small group of faith-filled Christians and church leaders as they reach out with counseling, hope, clothing, food and shelter!